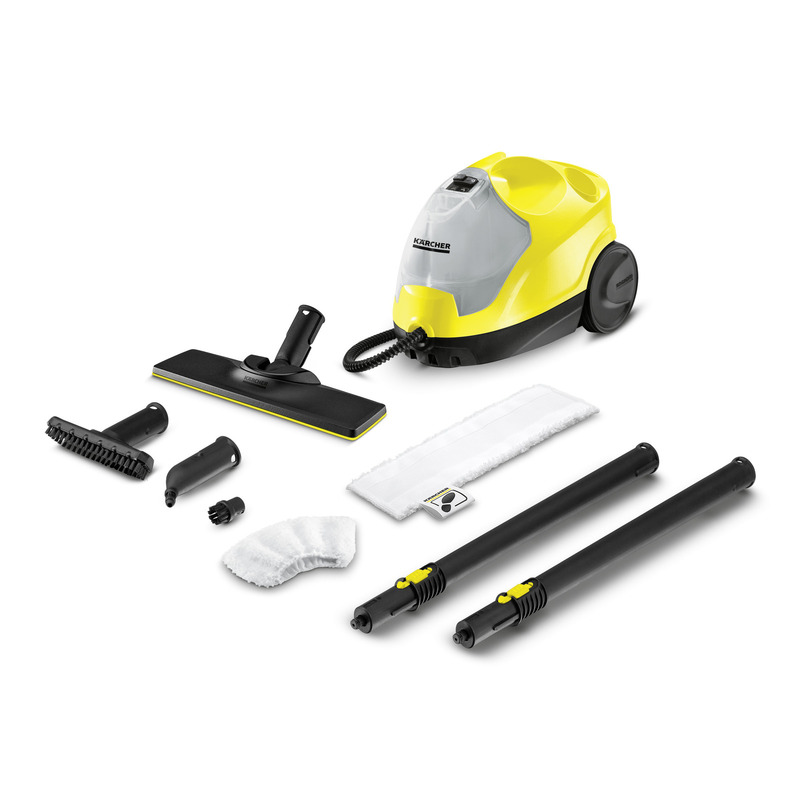 SC 4 EasyFix 15124520 https://www.kaercher.com/ie/home-garden/steam-cleaners/sc-4-easyfix-15124520.html This versatile machine packs a powerful 3.5 bar pressure making light work of dirt, limescale and stubborn stains around the home killing 99.99%* of bacteria using nothing but tap water. This versatile machine packs a powerful 3.5 bar pressure making light work of dirt, limescale and stubborn stains around the home killing 99.99%* of bacteria using nothing but tap water. The Kärcher SC 4 EasyFix puts the effective power of steam into a powerful package, harnessing the dirt-shifting power of pure, continuous steam to deliver amazing deep cleaning results from nothing more than tap water. The SC 4 EasyFix includes a 0.8L refillable water tank for uninterrupted cleaning, and makes light work of dirt, limescale and stubborn stains around the home, as well as keeping your hard floors clean and fresh. This versatile steam cleaner includes on-board storage for tools and accessories, with all the attachments and brushes needed to clean every corner of your home. It's great for removing tough grease from oven doors and hobs, everyday dirt from hard floors, stubborn stains, and even limescale and mould from tiles and taps, leaving your home effortlessly sparkling with no chemicals or scrubbing; and because Kärcher steam kills 99.99% of bacteria*, it’s ideal for allergy sufferers. The new EasyFix floor tool system ensures convenient hands-free cloth removal. Convenient water filling allowing non-stop cleaning. Secure storage of the cable and other accessories. Effective cleaning on different surfaces with the floor nozzle, hand nozzle and round brushes. A locking system offers reliable protection against improper use by children. The steam volume can be individually adjusted to the surface and dirt. Allowing easy accessory storage, including a parking position for the floor nozzle during breaks. SC 4 EasyFix is rated 4.8 out of 5 by 4. Rated 5 out of 5 by Example18 from Fast hygienic cleaning One of my best buys cleaned my bathroom, en suite, kitchen floors, cupboard doors, hob and interior doors all within 40 minutes. Would recommend to anybody thinking of buying it. Rated 5 out of 5 by Robey from small but powerful Its very small and lightweight but solid and not flimsy. I have a very old slate tile floor with grubby grout. Despite cleaning the floor on a regular basis, the tiles never really look clean. We live in Devon and the soil is pinky red which is very visible on the slate. I used the steam hose with both large and small brush attachment. Its lightened the grout and taken a good few layers of grime away from the tiles. Its not perfect yet but with a few more attempts the floor will look as good as new. I've got a lot of uses for the cleaner, its small and light enough to carry around the house and needs no chemicals. Its so easy to use - an absolute must for every house.